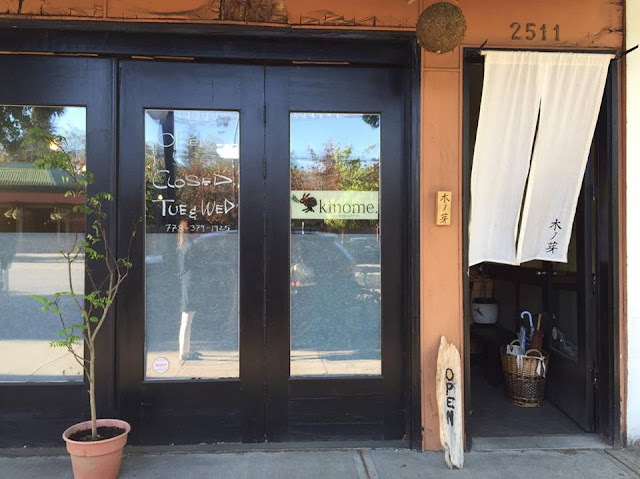 K loves soba noodles, so for our family outing, we decided to check out Kinome which has been much talked about for their handmade buckwheat soba noodles. They are only open for dinner and are closed Tuesdays and Wednesdays. Be sure to make reservations as it is usually full. The decor inside is simple but gives an authentic Japanese feel. They have a fresh sheet that changes up. The inside is very small. 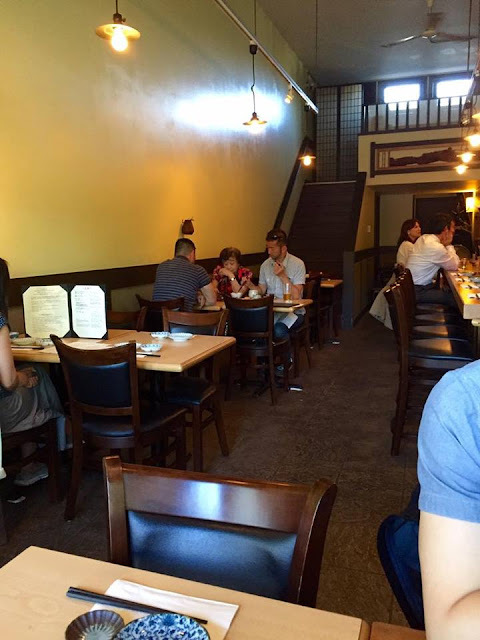 They have around 5 tables of four and the rest is bar seating. 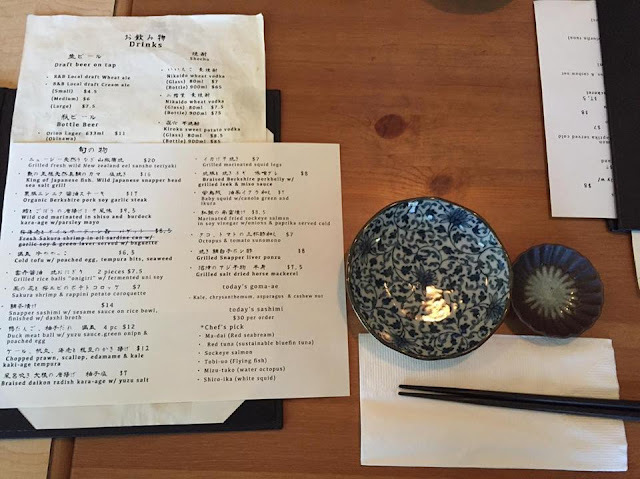 Bar seating would be perfect if you order their popular omakase menu. The only downside is there is no air conditioner here so it can get super hot. We started off with their famous Dashi Egg Omelette. 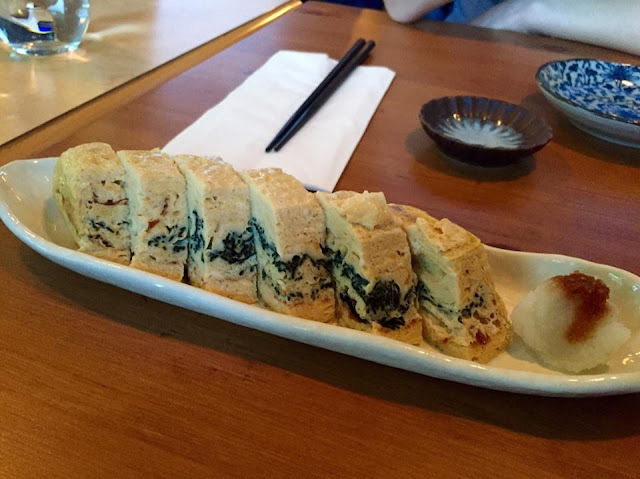 The egg was layered with seaweed and flavoured just enough while remaining a hint of sweetness. So fluffy and moist. One order of Today’s Sashimi features whatever the chef believes is most fresh. You can let the server know if you don’t like a specific type of fish. Our order came with 5 types of sashimi. 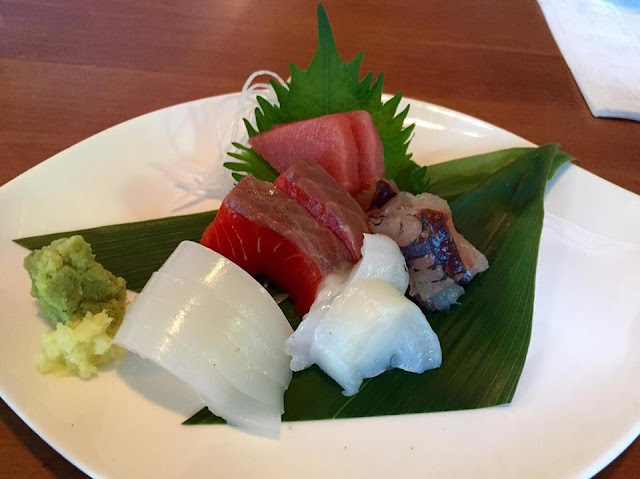 Our selection included Red Tuna (sustainable bluefin tuna), Sockeye Salmon, Tobi-uo (flying fish), Mizu-tako (water octopus) and Shiro-ika (white squid). 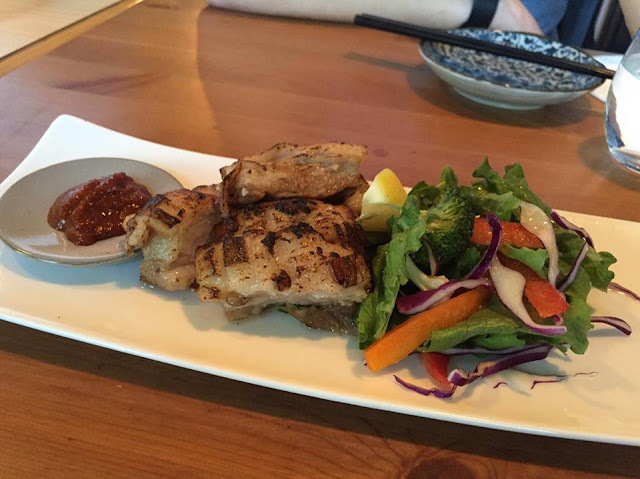 Flying fish was something new for us and wasn’t too bad! It has a slimier texture but wasn’t too fishy in taste. However, this dish is quite expensive at $30 for very small cuts. Very fresh though! 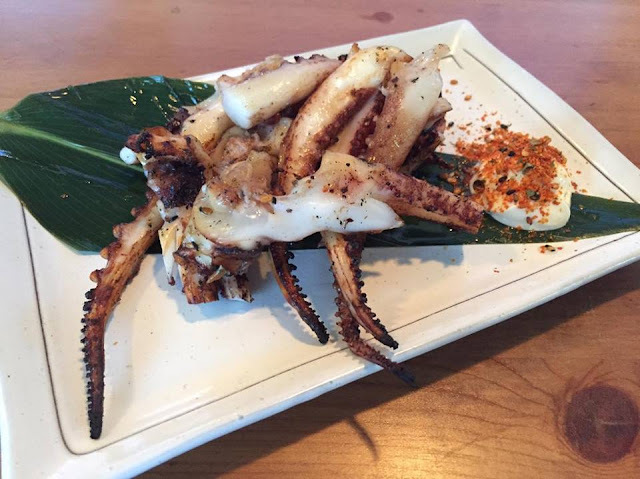 Next up were Grilled Marinated Squid Legs which came with a side of mayo. I liked how they had a bit of char on the ends and were very tender. The Prawn Tempura was battered so lightly and the shrimp itself was very fresh because it wasn’t mushy like the ones you get at all you can eat. It had that bounce! It also came with some asparagus. The Braised Berkshire Pork Belly was a delicious fatty goodness with the fat melting your mouth. 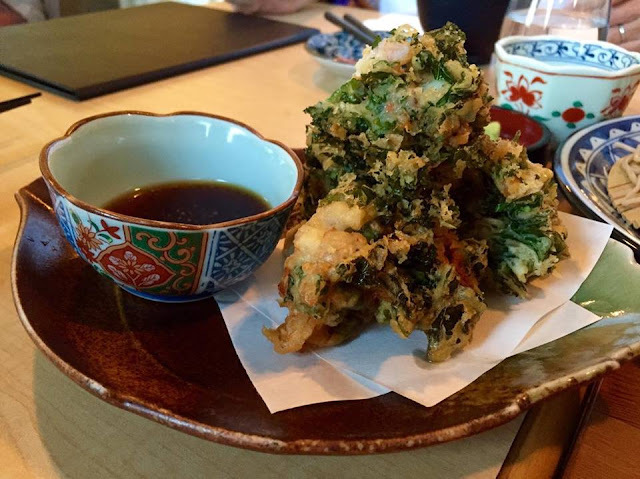 A favourite of mine was the Chopped Kale & Prawn Kakiage Tempura. 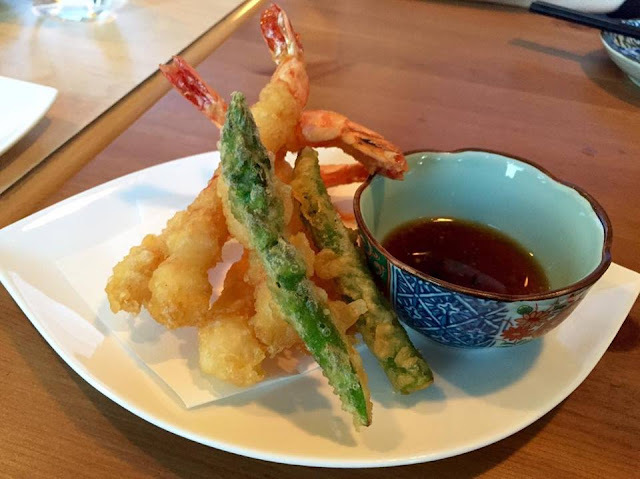 Never though you could tempura kale! It was filled with bits of shrimp and scallop too which was delicious! 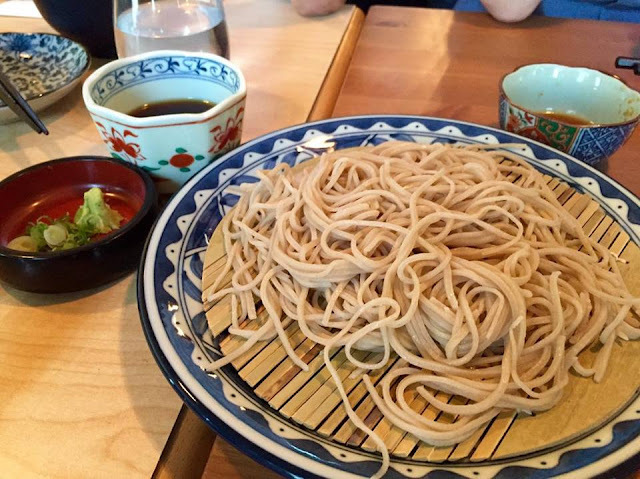 Next up was what we came here for – their handmade buckwheat soba! They have three choices. First was the Asakusa Soba which features hand made buckwheat noodle with green onion, tempura bits, radish, seaweed, and sesame. This dish is served cold and you pour a cold broth on top and mix it together. They advise you eat it as quickly as possible so the texture remains. 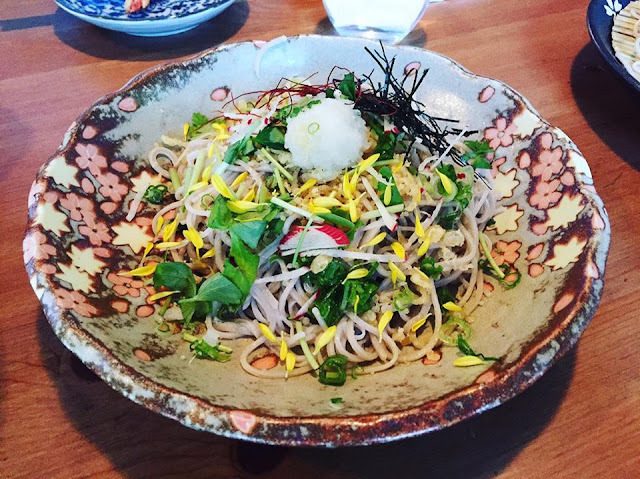 This one was great with a very fresh take on the traditional soba. The Zaru Soba was what I was used to. With this one, you can truly taste how fresh the noodles are. The texture has just the right amount of firmness. I can see why people go crazy over the soba here! My favourite was the Kamo Seiro Soba though. This was the same handmade buckwheat noodle but served with a warm duck dipping sauce. The sauce was just so flavourful without being too salty. 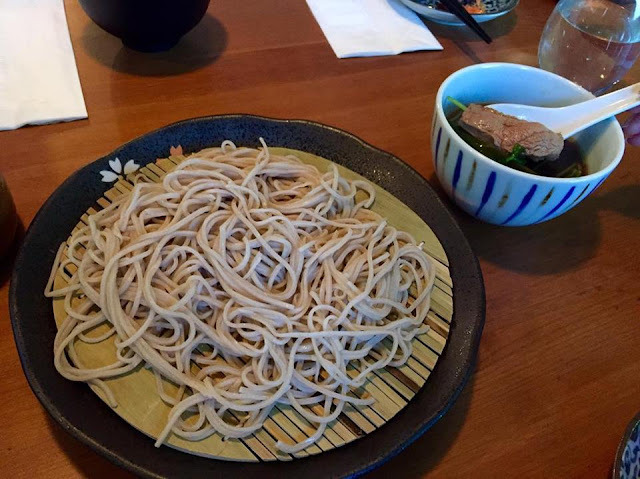 This soba is pricey at $16 but it does come with three tender pieces of duck and is irresistible! Kinome’s dishes tend to be smaller in portion size so of course we were still hungry. We decided to try their udon which is new on the menu. There are two choices so we got both. First was the Cold Udon which I absolutely loved. I think I might even like this more than the soba. The udon here is handmade as well and very thin. The cold broth really makes the dish refreshing and keeps that firm texture. The Warm Udon featured the same thin noodles, but I felt that because it sat in the broth, the texture of the noodles became slightly soft. Still, I really enjoyed both version of the udon. 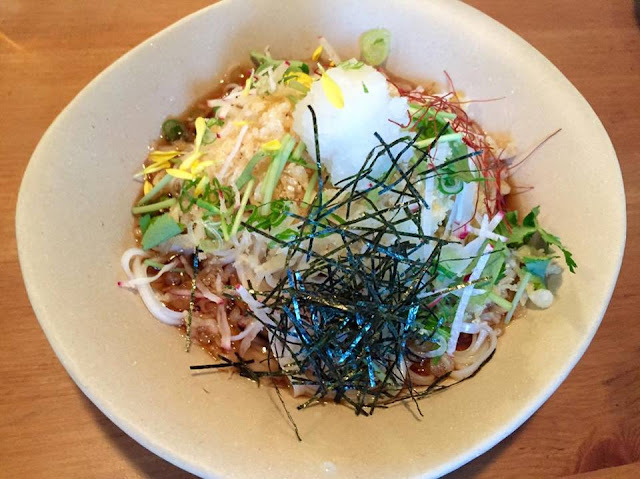 Overall, I was very impressed with Kinome’s dishes, especially their soba and udon. Prices are slightly on the higher side for the size of their dishes, but I think it’s well worth it. Plus, they are extremely environmentally friendly which is always a plus. Service was also very friendly. 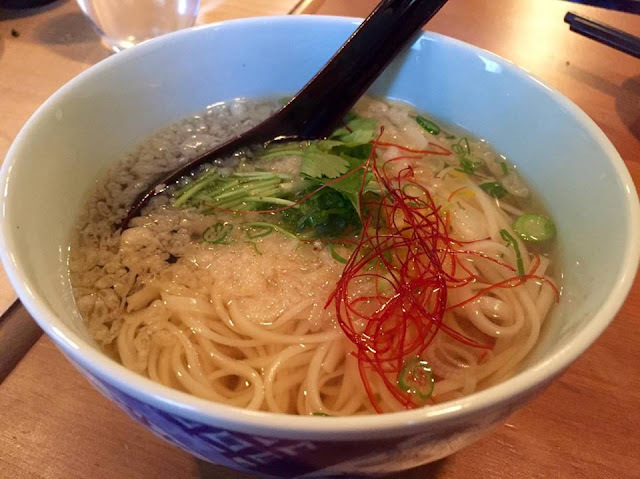 – Handmade buckwheat noodle and udon is a must order!